The 2017 Buick Envision offers even more options for luxury drivers with new entry-level, Preferred, and Essence trim levels. Buick has also added some important new technology like Teen Driver mode, which lets you set controls and encourages safe driving for your teens -- even when you’re not in the vehicle. So how does the new Envision stack up against its competition? Let’s compare the 2017 Buick Envision Preferred to the 2016 Acura RDX FWD and the 2016 Lincoln MKC FWD 4-door Premier in three key areas. You buy an SUV because you need to carry passengers and cargo, right? When it comes to overall size— wheelbase, height, and headroom--Envision has the edge. At 108.3 inches, the Envision has a longer wheelbase than RDX at 105.7 and MKC at 105.9. On a vehicle this size, those extra inches makes a difference. The Envision’s overall height is 66.8 inches, compared to RDX’s 65 and MKC’s 65.2. Front headroom on Envision is also roomier at 40 inches, compared to 38.7 for Acura and 39.6 for Lincoln. So how does the slightly bigger Envision do when it comes to fuel economy? Here’s where things get interesting. 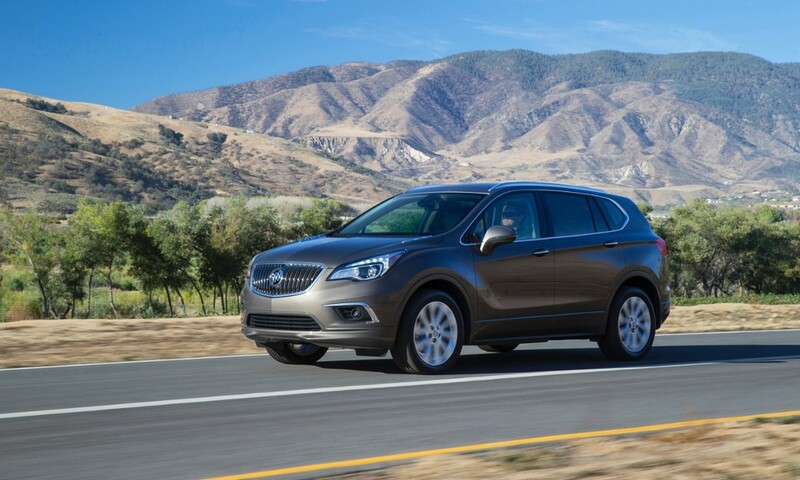 In spite of its larger size, Buick Envision manages to get better city mpg (22)* than the RDX and MKC (20 mpg). * On the highway, Envision ties Lincoln with 29 mpg and beats Acura at 28 mpg. * And with a fuel tank capacity of 17.3 gallons, compared to 15.5 for the Lincoln MKC and 16 for the Acura RDX, the Envision goes further between stops. And we all know on a long road trip, fewer stops means getting there sooner! When it comes to airbags, anti-theft systems, traction control and anti-lock brakes, all three vehicles are similarly equipped. But Buick has an important advantage over Acura when it comes to in-vehicle communication and assistance service, keeping you connected with available Apple CarPlay™ compatibility. Apple CarPlay™ allows you to use your compatible iPhone to access Apple Music and Apple Maps, make phone calls, and send messages. Even better, the Envision also has Android Auto™ availability, so you can seamlessly connect your compatible Android smartphone and get directions using Google Maps. Add the available 4G Wi-Fi hotspot and you’re always connected, always in touch, and safe. Test-drive the new 2017 Envision and draw your own conclusions. We think you’ll agree: when it comes to what matters in an SUV, the Envision stands out. See for yourself at Rivertown Buick GMC.